Nrvna by Netent - Get $5 Free! Nrvna is a harmonious slot game that transcends time and space, giving you an out-of-this-world experience. Netent, the developers behind the smash-hit Starburst (the single most played here at Pokies.com!) have done it again. Nrvna: The Nxt Xperience is Netent’s latest slot game and it takes all the best parts of Starburst while offering a whole bunch of fun, new (and hypnotic!) features. Nrvana is a 5-reel, 30 bet-line game. If you win with Wild symbols, you might win real big, as wild wins have an up to x3 multiplier (in case you’re wondering, the games payout percentage is 96.60% making it one of the highest paying machines at Pokies.com. Here’s a video of how the game looks like. 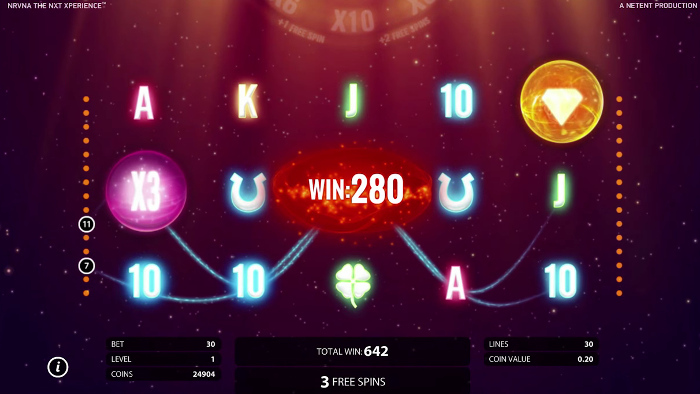 The Nrvna Wheel, which hands you free spins, win multipliers or both(!) makes an appearance at about 1:20. You can play Nrvna: The Nxt Xperience at Pokies.com with your computer (Windows or Mac) or with your mobile devices. Netent is the best mobile game developer bar none, which for you means that playing Nrvna on your iPad, iPhone or Android phone or tablet is going to be a fantastic experience. Most of Pokies.com players actually prefer to play these new Netent games on mobile as the game experience is just excellent. If you are new to Pokies.com, you can use your initial free $5 to play Nrvana. When you join up, you’ll also get a welcome package worth up to $800. If you are already a member, sign in to play Nrvna and to check what latest promotions and bonuses are available for you.